Having a coffee table in your home is really convenient especially if you are a social butterfly who likes to entertain guests in your living room. It’s a great place to display some beautiful trinkets, set out some refreshments or just as a display piece. 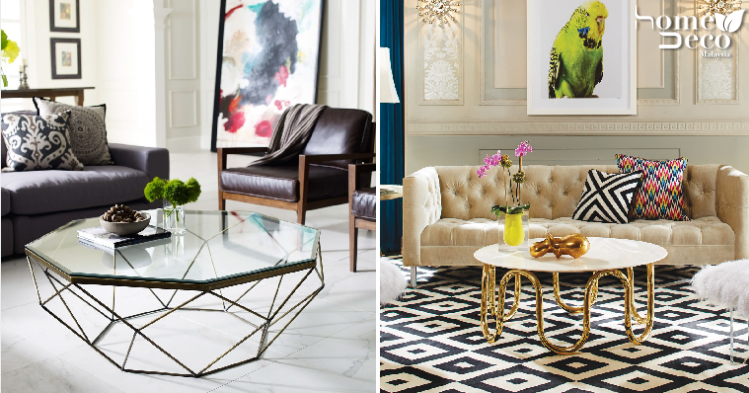 Here are some gorgeous and modern coffee tables that will definitely wow your guests. Think out the box and go for something really unique and special with this quirky glass table with an interesting geometric shape. It looks more modern and futuristic than the traditional square or rectangle coffee tables and makes a great focal point. Modern styles are all about clean lines and simple structures which is embodied perfectly in this trendy coffee table. It has a really simple look but what makes it stand out is the intricately curved golden legs that make it look so eye-catching. Metal is a really versatile element that can be used for various furniture in your home and the coffee table is a good example. It makes a bold statement in your home and you can keep the rest of your decor simple to allow the table to take centerstage. Although most coffee tables are conventionally made to be the same height as the sofa, you can consider this ultra-low coffee table for a different, modern vibe. You can do some cosy entertaining on the floor and it can even serve as an extra seating option when your couches are full. Having shiny copper elements such as this cool coffee table in your home adds a lovely contemporary touch to your home and it never goes out of style either. As you can see, you can even have a few if you have space and it still looks amazing.